Everywhere acknowledged as a modern American classic, winner of the Pulitzer Prize, and chosen by the Modern Library as one of the hundred greatest books of the twentieth century, The Power Broker is a huge and galvanizing biography revealing not only the saga of one man's incredible accumulation of power, but the story of the shaping (and mis-shaping) of New York in the twentieth century. Robert Caro's monumental book makes public what few outsiders knew: that Robert Moses was the single most powerful man of his time in the City and in the State of New York. And in telling the Moses story, Caro both opens up to an unprecedented degree the way in which politics really happens—the way things really get done in America's City Halls and Statehouses—and brings to light a bonanza of vital information about such national figures as Alfred E. Smith and Franklin D. Roosevelt (and the genesis of their blood feud), about Fiorello La Guardia, John V. Lindsay and Nelson Rockefeller. But The Power Broker is first and foremost a brilliant multidimensional portrait of a man—an extraordinary man who, denied power within the normal framework of the democratic process, stepped outside that framework to grasp power sufficient to shape a great city and to hold sway over the very texture of millions of lives. We see how Moses began: the handsome, intellectual young heir to the world of Our Crowd, an idealist. How, rebuffed by the entrenched political establishment, he fought for the power to accomplish his ideals. How he first created a miraculous flowering of parks and parkways, playlands and beaches—and then ultimately brought down on the city the smog-choked aridity of our urban landscape, the endless miles of (never sufficient) highway, the hopeless sprawl of Long Island, the massive failures of public housing, and countless other barriers to humane living. How, inevitably, the accumulation of power became an end in itself. Moses built an empire and lived like an emperor. He was held in fear—his dossiers could disgorge the dark secret of anyone who opposed him. He was, he claimed, above politics, above deals; and through decade after decade, the newspapers and the public believed. Meanwhile, he was developing his public authorities into a fourth branch of government known as "Triborough"—a government whose records were closed to the public, whose policies and plans were decided not by voters or elected officials but solely by Moses—an immense economic force directing pressure on labor unions, on banks, on all the city's political and economic institutions, and on the press, and on the Church. He doled out millions of dollars' worth of legal fees, insurance commissions, lucrative contracts on the basis of who could best pay him back in the only coin he coveted: power. He dominated the politics and politicians of his time—without ever having been elected to any office. He was, in essence, above our democratic system. 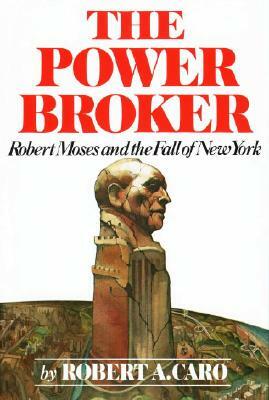 Robert Moses held power in the state for 44 years, through the governorships of Smith, Roosevelt, Lehman, Dewey, Harriman and Rockefeller, and in the city for 34 years, through the mayoralties of La Guardia, O'Dwyer, Impellitteri, Wagner and Lindsay, He personally conceived and carried through public works costing 27 billion dollars—he was undoubtedly America's greatest builder. This is how he built and dominated New York—before, finally, he was stripped of his reputation (by the press) and his power (by Nelson Rockefeller). But his work, and his will, had been done. Born and raised in New York City, Caro graduated from Princeton University, was later a Nieman Fellow at Harvard University, and worked for six years as an investigative reporter for Newsday. He lives in New York City with his wife, Ina, the historian and writer.